“Simple,” of course, doesn’t mean “easy.” Not by a long shot. But if you use Herbert’s words as a study, you’ll make much more progress in your goal to stop cowering from the things that scare you–whether or not those things happen to include hurling yourself out of a plane at our beautiful Georgia dropzone. Fear, after all, rears its stubborn head in all corners of our lives, manifesting itself in the costumes of jealousy, anxiety, self-deprecation, procrastination, narcissism…the list goes on and on. It thrives on going unnoticed for its true self. It proliferates madly behind its other masks because, unrecognized, it can not be killed. Its favorite outfit of all? Logic. One of the reasons we’re so passionate about skydiving–why we’ve been falling out of planes for as long as we have, and working hard to spread the word about the transformative power of skydiving–is that skydiving is by far the best method in the world to strip that coat of “logic” off of fear. Your fear hides behind lots of “logic” to keep you from skydiving. Do any of these sound familiar? Skydiving is dangerous. I might die. What would my kids do then? Skydiving is a frivolous expense. I have important things I could do with a couple hundred bucks. I’m not the kind of person who skydives, anyway. Let’s undress that fear, point by point. 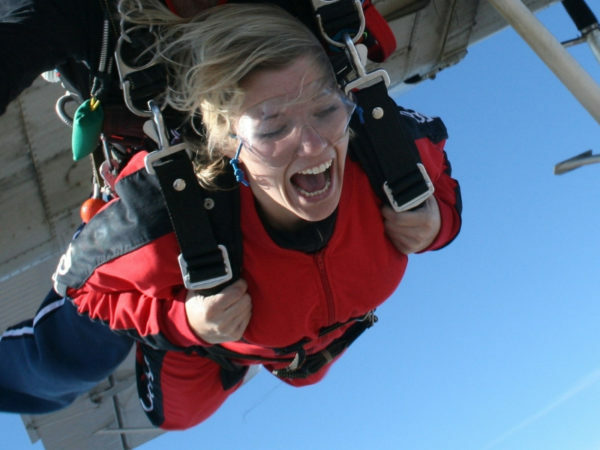 Are you scared that you’re taking an unnecessary risk by making a skydive? Actually, you aren’t. Perhaps it’ll raise your eyebrows that skydiving is actually statistically safer than commuting. Read up on the meticulously collected statistics of skydiving safety and then tell yourself you’re afraid for good reason. Faced with the facts, it’s impossible. Skydiving is a frivolous expense. Ah: Money. Money is a pretty logical reason to put on the brakes when something makes you uncomfortable. But how “frivolous” is skydiving, really, compared to the list of things you already habitually purchase? You already know that the benefits of skydiving outstrip pretty much any other way you can spend an afternoon— But how much is self-betterment really worth, after all? Four mani-pedis? Two pairs of middle-range shoes? Two nice dinners out? In your heart, you know you’re looking at fear, not frugality. Stare it down. Oh yes, you are. You, like every other human person, have been put on this planet to experience it as deeply and broadly as you can. The only difference between you and a skydiver is that the skydiver has physically lept into the curiosity that comes along with tipping up your chin and looking at the sky. You may deeply feel that you’re “no adrenaline junkie,” but you already know you do take joy in this kind of accomplishment. You know this because you’ve gone through this process over and over in your life. You learned to ride a bike when you were probably pretty sure it’d kill you–to calmly board and ride a commercial aircraft–to go down the big slide at the park–to drive a car. The younger version of you was brave enough to do much scarier stuff. This wiser version of you will tackle the challenge of a straightforward tandem skydive just fine. Go ahead. Tear the costumes off your fear. Naked, you can see it for what it is: An unhelpful dead weight, clawing at your ankles as you try to run towards your best life. So take Herbert’s words as a roadmap: Recognize it. Face it. Feel it. Then push past it. After you do, look back at where it was, and see that naked fear cowering behind you, looking as silly as a wet muppet. You’ll be primed and ready for the next challenge. We promise.